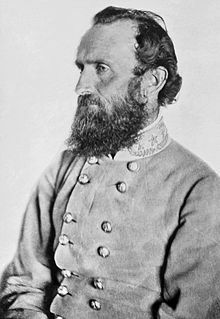 Ba ghinearál Meiriceánach é Thomas Jonathan "Stonewall" Jackson (21 Eanáir 1824 – 10 Bealtaine 1863). I gClarksburg, Virginia (Virginia Thiar inniu) a saolaíodh é. Ceannaire tábhachtach ar thaobh na Cónaidhme i gCogadh Cathartha na Stát Aontaithe a bhí ann. Lámhachadh é de thimpiste le linn Chath Chancellorsville. Téascadh géag leis dá bharr. Mhair sé roinnt míonna ina dhiaidh sin ach sa deireadh fuair sé bás mar gheall ar fho-iarmhairt niúmóine. Buille mór do chúis an Deiscirt sa chogadh úd é sin. Tugadh an leathanach seo cothrom le dáta an 19 Bealtaine 2018 ag 11:29.